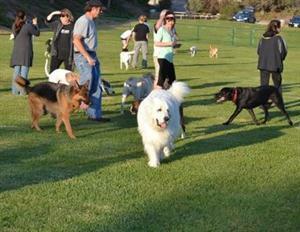 Dog parks can be great for dogs and their owners. But before opening the gate, talk with your veterinary team to make sure a dog park is right for you and your dog. “Dog parks often provide a suitable site to exercise and socialize dogs,” said John Tait, DVM at Blair Animal Hospital, an AAHA-accredited clinic in Canada. However, pet owners should make sure that parks are not overcrowded, that they are cleaned regularly, and that they are enclosed with material that dogs cannot destroy. Christine Holter, DVM, of Animal Hospital of Diamond Heights, an AAHA-accredited clinic in California, likes the socialization (interaction with other dogs) that parks offer, but she warns pet owners about risks, including exposure to viruses. Ask your veterinarian how old your puppy should be before he/she goes to a dog park. The timing of vaccines — for diseases like parvovirus — is a particularly important issue. To be on the safe side, Holter suggests waiting six months before taking puppies to dog parks. Certain breeds, like Pit bulls, chihuahuas, and rottweilers, seem to be more susceptible to parvo, though any puppy can get it, she added. “The older they are the more competent their immune system is and the better their ability to fight off the virus naturally,” she explained. Dangerous situations can also arise at dog parks, Holter said. She encourages pet owners to watch the dogs carefully and try to get them back on leashes if they can do so safely when they sense a fight is about to occur. “Often if they’re being aggressive, verbal commands won’t work because they’re too distracted,” she explained. To minimize the risk of aggression, professionals emphasize training, which starts with puppy obedience classes, as well as recognizing a dog’s limitations. “If [pet owners] know that their dog doesn’t deal well with other dogs, they need to think about keeping their dog on leash or possibly not even taking the dog to a dog park,” said Ryan Holter, co-owner of the Animal Hospital of Diamond Heights. If you decide to explore the world of dog parks, check the Internet for places in your area. For example, www.dogpark.com has a list of dog parks in the United States and Canada with information on locations, amenities, and hours. Also ask your veterinarian for recommendations, and visit the park solo first. If it seems clean, owners are vigilant about picking up after dogs, and there are clearly-posted rules and regulations, go have fun with your canine companion.